Lock in a great price for Selina Maderas – rated 8.1 by recent guests! Beautiful facilities, grounds, and the best breeze around. Excellent 8 AM yoga ever day ($5 fee), refreshing pool, fast WiFi. 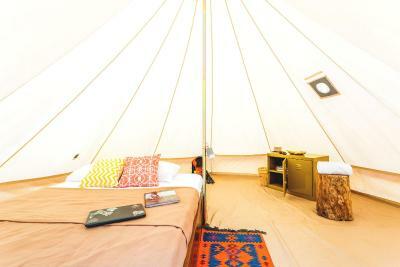 We stayed in one of the teepees which was surprisingly comfortable and had a strong fan. Good shared kitchen. 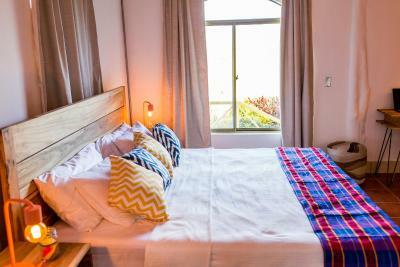 We had an amazing stay at Selina Madras, the meeting point if you love surfing. Martin and the rest of the team were very friendly and very helpful at any point. We did an amazing horse ride along the beach side into the sunset, perfectly organized. For little snacks in between you should however bring your shoppings from San Juan as there is no shop around the beach places at all. Thanks for your support Martin! Pool and air conditioning were perfect. Very clean and nice beds. The transportation facilities are really good, unless you’re heading back to the capital, which would be really expensive. The reception staff is lovely. 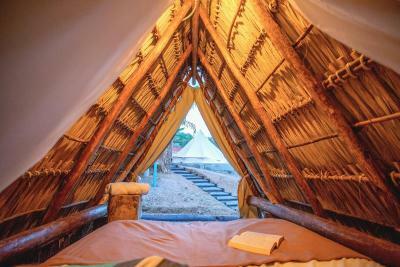 I stayed in a tipi and slept really well. The food is great, but can be expensive. Just pick your lunches and dinners wisely. The breakfast is 163 NIO and is a buffet à volonté. It’s yummy and filling too. Staff is polite and willing to help, but also very welcoming. The view from the top of the property is breathtaking. I will certainly be back in one of their Hostels. The room was Amazing. perched between mountains. Unbelievable view. Extremely relaxing. Great facilities! 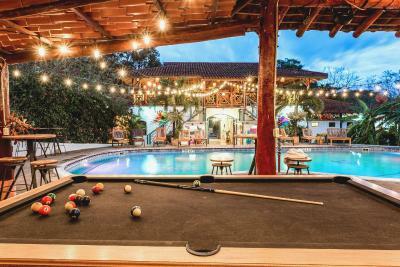 Pool area has a bar, loungers and pool table. Nice restaurant that overlooks the pool and property, with a breakfast buffet and nice smoothies. Daily morning yoga was really nice and in a beautiful space. They can help arrange activities. Beautiful facilities. The rooms (I stayed in a dorm) were excellent, air conditioned, hot shower, comfy beds. Breakfast was great (145 Cordobas / $5.00) for all you can eat buffet of eggs, Gallo pinto, potatoes, fruits and yogurt. Friendly, helpful staff, great evening activities. 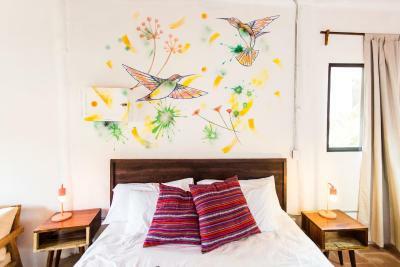 One of our top picks in San Juan del Sur.Located a short walk from the famous surf spot Maderas Beach, Casa Maderas offers accommodations a 20-minute drive from the lively town of San Juan del Sur. 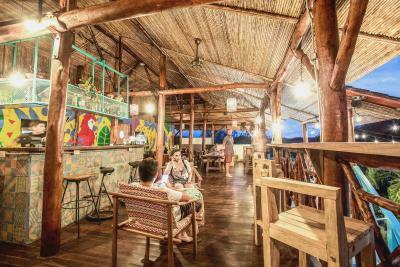 It features an on-site restaurant and bar, plus an outdoor swimming pool. 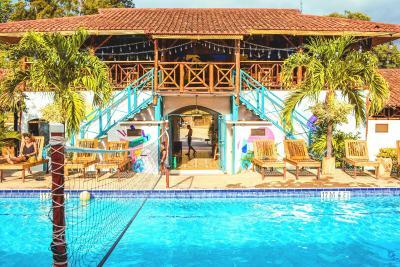 The Nicaraguan tropical-style rooms and bungalows here include a ceiling fan and a patio with views of the pool and gardens. 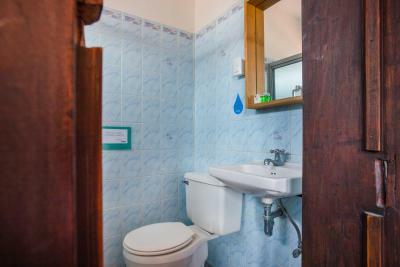 They also have a bathroom with a shower with room-temperature water. Maid service is provided on request. WiFi is available in all rooms. 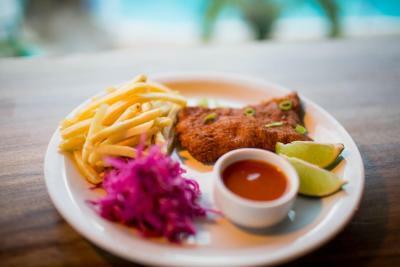 Snacks and soft drinks are sold at reception and guests can enjoy international cuisine at the hotel’s restaurant. The tour desk can help arrange tours and activities for an extra cost, including surfing, horse riding, zip lining and on certain seasons, turtle watching. 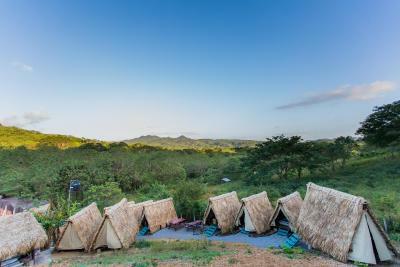 Daily yoga classes and massage sessions are also offered. 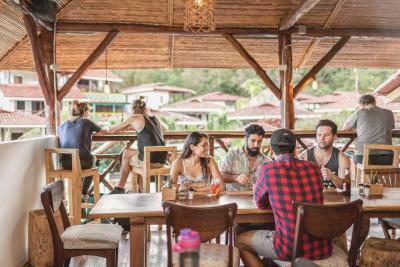 A shuttle service to San Juan del Sur town center is also available but at an extra fee. Managua International Airport can be reached in 3 hours by car. Airport shuttle services can be arranged at a surcharge. 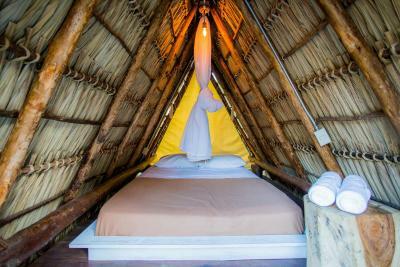 When would you like to stay at Selina Maderas? 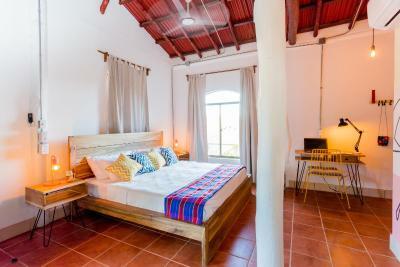 Casa Maderas is built in a traditional Nicaraguan finca style. Located a 20 min. ride from San Juan del Sur and a 10 min. walk from Maderas Beach, we are surrounded by nature and believe that our eco-friendly initiatives minimize our impact on the environment. 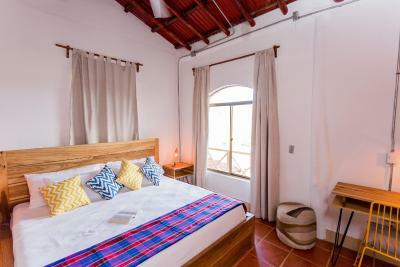 Our simple but comfortable rooms include bathroom, ceiling fan and mosquito net on each bed. We don’t offer air conditioning, TV or hot water. 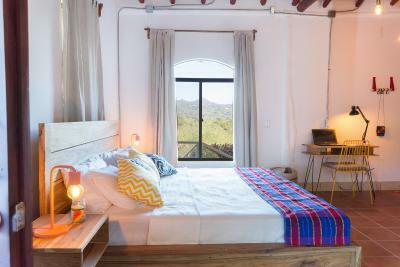 Located on a hillside, all rooms have screened openings to benefit from the natural ventilation. The water is just at the right temperature to cool us down from the tropical heat! Here our guests are invited to enjoy the nature beauty and sounds, relax by our large pool, explore the nearby beaches, and to partake in our daily yoga classes and many other activities. 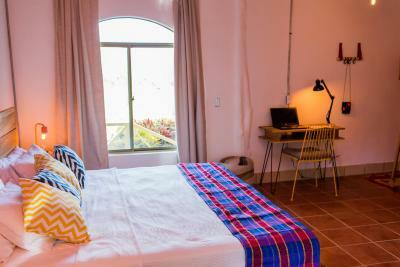 Casa Maderas offers a quiet and friendly atmosphere. Our restaurant & bar is open all day until 9:30 pm but after, its quiet time and we ask our guests to lower voice & music volume. Casa Maderas is made for travelers looking for a relaxing and nature experience but NOT recommended to people looking for a party place which can be found in town. House Rules Selina Maderas takes special requests – add in the next step! Selina Maderas accepts these cards and reserves the right to temporarily hold an amount prior to arrival. Property does not accept American Express as a guarantee of reservations. Property accepts Visa or MasterCard only. The staff was not really helpful. They were having fun together and inviting there friends over. Food was super expensive (6 dollars for two slices (tiny) of bread with avocado). We booked for 3 nights and couldn’t use the pool for two days (it was empty). At least the location was good. The private room was ok.
No TV in the suite and no fridge , it would be nice to have for the kids. It is not located on the beach. 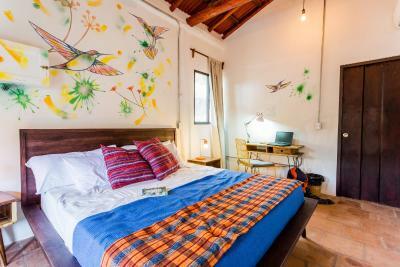 The hostel is really pretty and very clean. The staff were always trying to sell me something. The hill between the ocean and the Hostel. It is a good hike but if you want to surf early morning it can be a bit annoying. The dinner options were small for the price. The facilities were clean and modern. The pick up and drop off service. Breakfast options were delicious. Upgraded to room with private bathroom. Lots of mosquitoes so bring repellent. Breakfast is included, but other food is expensive so shop in San Juan del Sur before arriving. It's a hot uphill walk to Maderas Beach. Website says free shuttle but that's not true so plan to walk. It would be nice if there was an electric tea kettle in the kitchen. I have no idea how Selina Maderas isn't rated higher, this place is awesome. 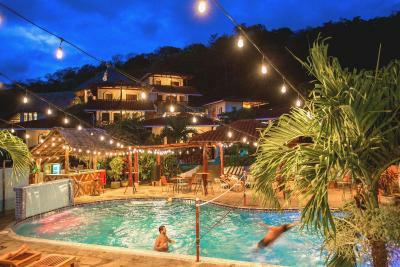 The staff are incredibly friendly and go out of their way to make you feel welcome, the pool and the vibe and the music is all great. The dorms are nice and very clean and have air conditioning and fans. The bathrooms are always clean. The coworking space is brilliant and super cheap. All things considered I think it's probably one of the best hostels I've ever stayed at, especially for this price. The kitchen was unfortunately poorly equipped and really dirty. This is extremely important due to Selina’s location - there are no shops around and prices in restaurants are 3 times higher than in the rest of Nicaragua so it would be great to be able to prepare a meal in a clean kitchen. Friendly and helpful staff, great pool area, comfy beds and nice vibe. My few remarks to be aware of is the area is quiet which means most restaurants close early (9pm) food in the area is also a bit pricey so you may want to take advantage of the kitchen. Also the latest return shuttle from San Juan is at 5pm I think it would be great to do something around9/10pm so that you could watch the sunset from town. Otherwise nothing but great things to say! 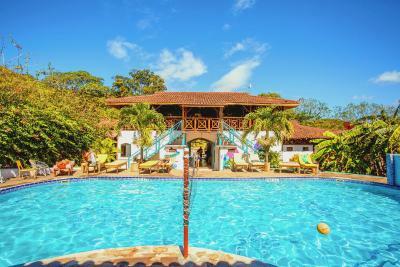 Selina’s Maderas is an amazing oasis that allows you to escape the hectic San Juan Del Sur. It is within walking distance to 2 beaches: Marsella and Maderas Beach (there is an uphill but is completely manageable) The staff are extremely friendly and the resort and facilities are stunning! If you are looking for a calm environment to relax, take a surf lesson and do yoga than this is the place for you! They offer daily shuttles so that you can go check out San Juan. 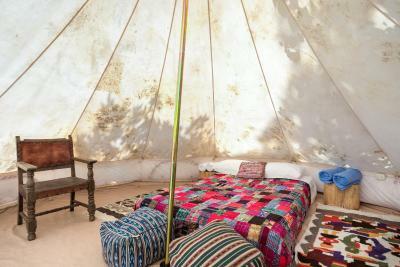 I booked 2 nights in the teepee and stayed for 8! There are other resorts in the area so you can go explore and enjoy a drink by their pool for a change in scenery. The kitchen was not clean and nobody felt responsible to clean it. Also the toilets were not so clean. After asking the staff if they could clean the toilet they just locked the door which was ridiculous and behaved kind of pissed. Also the restaurant is quite expensive. Everything was great for the value for this hostel . Selina, keep doing what you are doing . Don’t give up on your standards. We had a really good time there, the staff is amazing, ( Tatiana and janci were rockstars ) , amazing poop and really cold beers. After 5 days I had to ask twice to have the shared bathroom cleaned. Restaurant was always closed and there is no where else to eat close by. The facilities are very nice. Great yoga space & coworking room.